A scene from Phoenix Rising. Photo by Jana Marcus. BOTTOM LINE: A lyrical piece with a strong movement component about women finding the courage to heal from physical and sexual abuse. Phoenix Rising opens with a matronly goddess (Kristen Vaughan) atop a high celestial staircase assuring her five daughters below that even though they are destined to feel pain and suffer, she will always be with them. She then descends the staircase and enters a high school classroom where she takes her place as a group therapist for teenagers who have suffered physical and/or sexual abuse. She asks them to pick a card that profiles the goddesses of Greek and Roman mythology, and encourages them to research and connect with their deity. She then invites them to embody their assigned goddess in order to find the strength and courage to share the story of their own abuse. 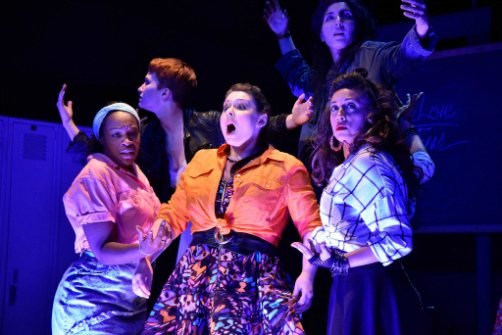 The stories are heart-wrenching and told with tremendous passion and commitment by a sensational ensemble of five women in addition to Vaughan: Julia Peterson, Rachel Haas, Miranda Roldan, Nichollette Shorts, Whitney Biancur. Written and directed by the exceptionally talented Laura Gosheff, each story is told through gorgeous poetry and expressive choreography. Vaughn plays the counselor with soothing and supportive grace. I found myself pining for the opportunity to share my own woes with her. Sheryl Liu provides a simple set design that effectively doubles as a believable high school and a heavenly realm for the goddesses. The transition between the two is made seamlessly with the help of Seth Reiser's beautiful lighting design. Lighting plays a key component in the storytelling, as it repeatedly delivers us from the drab fluorescent lighting of an institutional classroom into the colorful, chimerical landscape of each story. His design fluctuates between the oppressively realistic and the imaginatively fantastical. Though I found the storytelling in some of the episodes confusing and difficult to follow, the play is always visually and aurally engaging. The conclusion is quite heartwarming and uplifting. Anyone who has experienced abuse on any level will likely find an opportunity to connect, shed a tear or two, and perhaps find the strength and inspiration to confront the past and heal. Phoenix Rising is written and directed by Laura Gosheff. Set Design is by Sheryl Liu. Lighting Design is by Seth Reiser. Costume Design is by Angela Harner. Sound Design is Julian Evans. Music Design is by Lena Gabrielle. Movement is by Javier Baca. Stage Manager is Derek Bado. The cast is Kristen Vaughan, Julia Peterson, Rachel Haas, Miranda Roldan, Nichollette Shorts, Whitney Biancur.